If you haven't heard yet ... there's a new market place that just opened called GOOD GOODS. If you're familiar with Rosa Ng's Young Young and Able pop up's and workshops, then you're going to love her collaborative lifestyle store on Prince Street in Manhattan. This magical space represents a new generation of makers that are passionate about forming a deeper relationship with the sources, the processes, and the narrative stories behind products and services. Good Goods embraces the small-batch, the limited editions, and the one-of-a-kind philosophy. And part of their experience are curated workshop series to help further their mission of connecting makers to the consumer. So we attended a really awesome class called " Botanical Perfuming with Aba Love Apothecary", which took place at Good Goods on Tuesday October 17th! The two hour class was jam packed with botanical scents, new vocabulary and wine ... a good old fashion girls night. The group tested 19 different scents (essential oils, CO2 extracts and absolutes) all having distinct characteristics and purposes for the mind, body and spirit. From tobacco and basil to rose and lime - participants were forced to exercise and build their "Olfactory Awareness". The class was relaxing yet very educational. To everyone's surprise, guessing the fragrance name before Aba disclosed it, was quite difficult ... even the scents that we're all very familiar with. As we acquired smelling strips with different scents, everyone took notes on the aromatic profiles. By the end of the session, guests created their own scent infused with at least one top note, middle note and base note. We all happily walked hope with a custom fragrance, nicely bottled and labeled. When and why did you start Aba Love Apothecary? 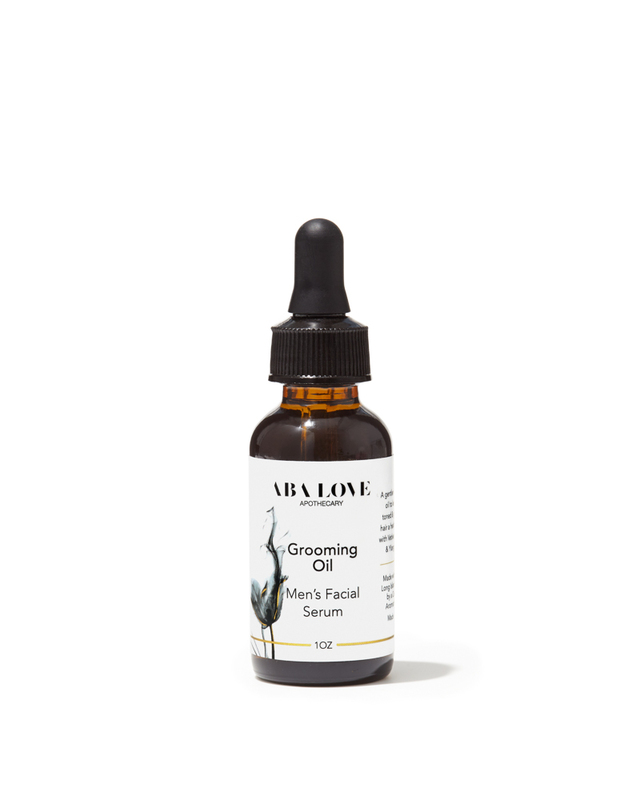 I launched Aba Love Apothecary in June of 2016. Well before that I trained as an Aromatherapist and became certified in Aromatherapy. I began Aba Love Apothecary initially based on my love of per-fume but after doing much researching I was much more drawn to essential oils because of their three-fold healing properties ; functionally (for use on the skin), of the mind and of the spirit. I also wanted to create something in which I could share with people, for me I found it was a way of being in service to others. What was your love/interest in plant medicine? In terms of “ Plant Medicine” this term these days is quite varied. It can mean anything from working with herbs, TCM, etc. But for me I initially connected to botanicals through my self-care practices. My practioners would use essential oils to boost the treatments, so I left treatments floating. I smelled glorious and I loved the way oils left cover me with a veil of scent. I also loved the element of discovery in studying new botanicals for their storied use as well as new ways to incorporate them into personal care and overall wellness. As maker, I would say this is not so much my definition but more so how I plan to operate in a way that is sustainable. Firstly and always, I select ingredients from vendors I trust with sound business practices and certifications. Some of my raw material availability isn’t necessarily consistent, which can be a good challenge- it forces me to work with the breadth of what is available without sacrificing quality. When I think about product creation, of course I want to play with beautifully exotic materials but the truth is most of them are precious with limited availability and costly. As a business I need to look for ways to sustain financially without sacrificing product integrity. Looking ahead I have to be aware of how my usage of raw materials impacts the people that harvest the raw materials and environment as a whole. I don’t ever want to get to a point of straining a resource, so I use potent ingredients that go along way and work in small batches. What are the ingredients for your products and where are they sourced? My ingredients are sourced from artisanal distillers and harvesters all around the globe. There are few specific ingredients I use that I source from specific countries because I may prefer the aromatics/specific make over another. For example, the Wildcrafted Palo Santo essential oil I use is from Ecuador. The raw shea butter I am currently exploring with is from West Africa (Ghana). My parents are from Ghana, so of course this is the one I know best! Lavender, for example, there are several origins I may choose from which all have their own unique benefits depending on my intention. I may decide to go with Provincial French Lavender, English Lavender or Portuguese Lavender. The aromatic profiles are unique as well, so that’s another reason to be eclectic when sourcing. Does being a woman of color influence your brand? If so, how? As a woman in general, I know we all share a common bond in how we want to feel in our beauty rituals: beautiful, worthy of the delights we let touch our skin, and deeply cared for. As a woman of color, it’s important for me to be seen so other WOC can see that yes--this luxury is for me and it was made by someone that looks like me and speaks the same spoken/unspoken language as me. 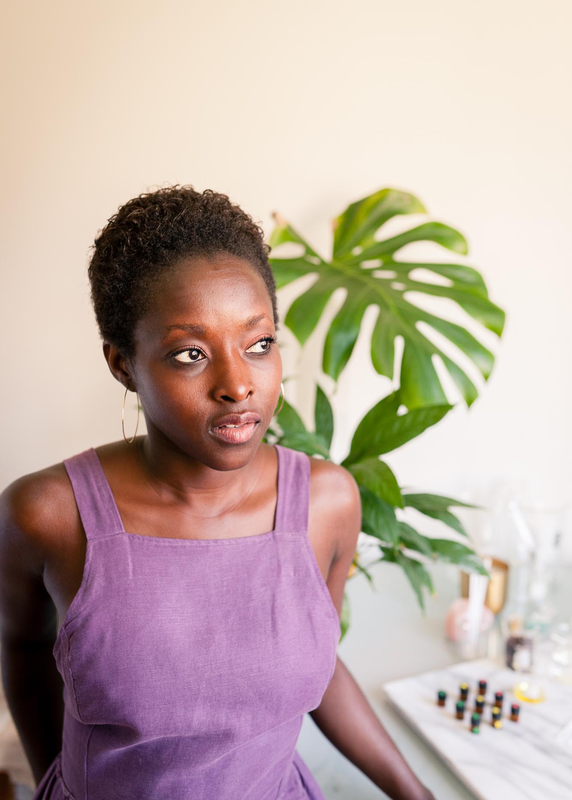 It’s no news that WOC have been under represented in the beauty & wellness industries but there’s been very real and palpable shift that has been happening and it’s amazing to be apart of that. And of course, there’s a certain texture and sensibility (if you will) that’s layered into the vibe of WOC brands that’s unique to us and that is part of our magic.